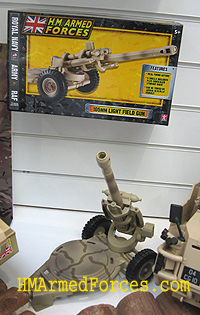 At the London Toy Fair on January 25th 2011 Character unveiled their new HM Armed Forces toys for 2011. First mention must go to the Army Apache Helicopter. Fully armoured this four-blade, twin-engine attack helicopter comes with a chain gun carried between its main landing gear under the aircraft’s forward fuselage. 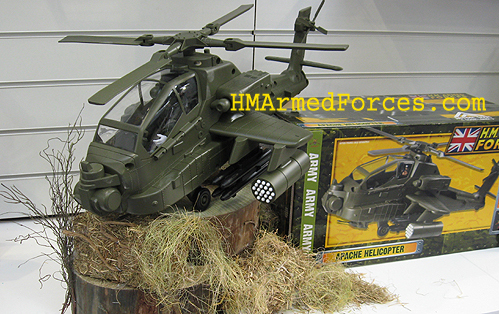 The superb new HMAF Apache Helicopter features real firing wing rockets and rotating rotor blades. The Apache’s cockpit opens to fit in an HMAF pilot figure. Verdict: its awesome! Also mentioned in dispatches is the HM Armed Forces 105mm Light Field Gun. The Field Gun features a real firing action with six shells included. The Light Field Gun can be towed by the HMAF Jackal MWMIK vehicle. 2011 will see the launch of a new version of the Spring Powered Launcher with the RAF Red Arrows liveried jet added to the range. 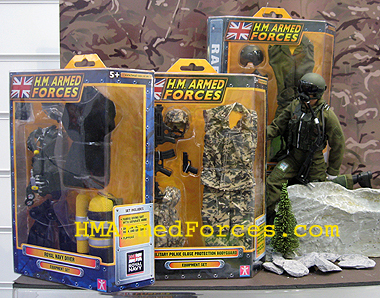 Fans of the HMAF action figures will be delighted by the release of new accessory packs. We’ll get the Royal Navy Diver Equipment Set; the Military Police Close Protection Bodyguard Equipment Set; and the RAF Fast Jet Pilot Equipment Set. And all that’s in addition to the previously announced Combat FX Talking HMAF Figures!